An Implant Supported Overdenture is a contemporary restoration that has revolutionized the way surgeons and dentists think of replacing a full set of teeth. Standard dentures are unsecured prostheses with inherent limitations. Most often, dentures are painful, inconvenient and unstable. Such dentures can make chewing foods difficult, limiting the foods that you once enjoyed. Modern dentistry can help with implant supported dentures. The Implant Supported Overdenture treatment concept replaces your missing teeth with a full dental bridge supported by dental implants. Fewer implants are needed and overall treatment time and cost is reduced. An Implant Supported Overdenture solution also ensures greater stability in the bone, reducing the need for bone graft surgery to increase bone volume. Implant-supported overdentures stay connected with bar and clip attachment methods or use a variety of abutment-based attachments (ball, magnets, and resilient stud attachments such as Locators). The most appropriate attachment system for your individual needs relates to a variety of factors that is determined early in the treatment.Typically, a temporary set of teeth can be placed on the same day of surgery. The temporary teeth allow you to lead a normal life immediately after surgery. After a short healing period, your dentist will place the final bridge. Your quality of life is improved, and you can start enjoying your favorite foods again with renewed confidence. Scientifically proven and documented. Implant Supported Ovedentures have had good clinical outcomes from decade long studies with favorable results. Oral and maxillofacial surgery requires additional years of hospital-based surgical and anesthesia training after graduation from dental school. As an oral and maxillofacial surgeon, Dr. Sutley manages a wide variety of problems relating to the mouth, teeth, and facial regions. Dr. Sutley practices a full scope of oral and maxillofacial surgery with expertise ranging from dental implant surgery and wisdom tooth removal to corrective jaw surgery. This also includes techniques designed to rebuild bone structure with minimal surgical intervention and optimal patient comfort. Our office can also diagnose and treat facial pain, facial injuries, and fractures. 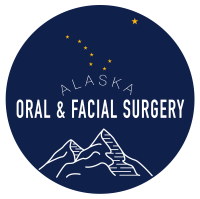 The surgical staff at Alaska Oral & Facial Surgery Center are experienced, certified oral and maxillofacial surgical assistants, who assist in the administration of IV sedation and surgery. We also have a trained registered nurse (RN) to assist in surgery. All staff are informed administrative personnel, well versed in health and insurance policies, and are CPR certified.